Q – You co-host “Nikki and Sara Live” on MTV with comedian Nikki Glaser. This is essentially formatted like a late-night show. How different is producing/hosting a show like this than what you were doing on “Late Night with Jimmy Fallon” as the Head Blogger? A - Both jobs are a ton of work. Fallon was a nightly show, and everybody on the staff worked so hard. But now that I'm co-hosting, co-producing, and helping write our own show, it's on a whole new level. I have such an enormous amount of respect for Jimmy - after the first time we did “Nikki & Sara Live,” I woke up the next morning and thought, "What if I had to do this again tonight?" I couldn't fathom it. The daily talk show hosts are amazing for what they do. Q – You won two Emmy Awards for your work on “Fallon.” What was that like? A - Incredible. The show was still so new when we won. It was the show's first Emmy, which was a huge honor. We won in a category I didn't even realize existed: Creative Achievement in Interactive Media – Non-Fiction. I'm not even sure that category still exists. They've been gradually figuring out how to honor television's interactive stuff, so the awards have changed over the years. It's exciting to know that I was part of something new and innovative. The ceremony itself was SO insanely cool. I didn't realize the Creative Arts Emmy's would be just like the Emmy's you see on TV - black tie, same theatre, celebrities galore. Going up on that stage was one of the most incredible things I've ever experienced. And to share it with my coworkers who were so great - Gavin Purcell, Cory Cavin, Jon Friedman and of course Jimmy Fallon - was amazing. Q – You also do stand-up and appeared on John Oliver’s “New York Stand-Up Show,” which, the episode you recorded, will air this Friday, August 2nd. How did you get involved with John Oliver and this project? A - I've been trying for years to perform some of my stand-up on TV. I've achieved so many other milestones in my career but couldn't quite land that cherished first spot on TV. So I just kept my head down and kept working on my jokes. Finally, John and his team noticed me and decided I was ready. I'm absolutely thrilled that my television stand-up debut is going to be on this show. I am a huge fan of John's and all of the other comedians who performed. The entire process and his whole crew were awesome. They put on a great show. Q - How do you go about condensing material you do at a comedy club to a TV set which is much shorter and cleaner? A - It was extremely difficult for me at first. For many years, my stand-up wasn't very TV friendly. It was a lot of storytelling and often involved multi-media. When I first attempted writing a really tight, punchline-packed set, it was a disaster. I was writing terrible jokes to try and replace my better, longer material. But finally, gradually, I began to understand how to turn my longer bits into shorter jokes. I also credit my TV show and Twitter for helping me learn those joke writing skills. I think the result has been what I hope is a unique voice. At my heart I'm a storyteller, so that shapes my shorter jokes differently than someone who is just trying to think of a clever turn of phrase. For instance, I have a joke about my love of following the rules. At first, it was an elaborate story about an airplane, my childhood, and my general theories about safety. But now, it's boiled down to 30 seconds and encapsulates all of it into something short and impactful. Q - Are there specific jokes you do on TV and not on stage? A - I do the cleaner ones on TV. I have a lot of extremely personal, dark and dirty stuff that may frighten the masses. I'm still figuring out how to make that stuff more palatable to a general viewing audience. Q – Years ago there were very few women in comedy. 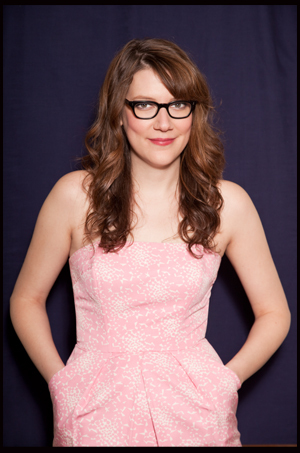 Now, it seems like funny women rule the airwaves with Tina Fey, Margaret Cho and Jane Lynch. Which comedians/comic actors, specifically women, did you grow up watching and which one did you learn the most from? A -I loved all comedy growing up but in terms of females, I loved Rosie O'Donnell, Roseanne Barr, Molly Shannon, Cheri Oteri, Janeane Garofalo, Wendy Liebman, and Miss Piggy. I think, however, I've probably learned the most from the females I've personally befriended and worked with over the years. Some of whom include Nikki, our head writer /showrunner Kim Gamble, Brooke Van Poppelen, Michelle Collins, Amy Ozols, Ann Carr, Adira Amram, Katina Corrao, Mindy Raf, and so many more. Q – You’ve been involved in stand-up comedy, internet production and now television. Which do you enjoy doing the most and why? A - I enjoy the things that combine all of my skills. I love firing on all cylinders. That's why I love our TV show. We're writing and performing jokes, putting on a TV show, and I'm heavily involved in our internet side of things. Q – Before I let you go, Fallon is set to take over Jay Leno’s spot on “The Tonight Show.” We saw what happened to Conan (O’Brien). Even though you’re not with Fallon anymore, what are your thoughts about this transition? A - Jimmy's gonna kill it. “The Tonight Show” is his. At “Late Night,” it always felt like he was doing this big, fun, relatable, amazing show. In many ways, he was already doing “The Tonight Show.” So I think the transition is going to be great. I can't wait to see it.